Like the AnyVape Fury Tank, the Aspire Triton comes with advanced top filling capability and drip tip airflow control. The top filling can take new users by surprise (especially when you try to bottom fill – you can’t!) But it’s actually easy to use apart from the annoying small hole provided for the refill capability. Overall, this is an advanced, TC compatible tank which provides a great vape – but do be careful to keep the tank in use mode when not refilling. I love Aspire and the consistently high quality of products they put out. 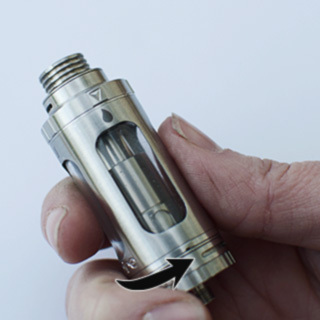 As with the Fury Tank, the Triton also comes with a top filling system. This means you can fill the tank from the top without having to take the whole clearomiser apart or remove it from the battery. You also have to wonder if this is an early experiment with TPD leak free refilling requirements. I also like the steel that surrounds the pyrex tube, which decreases the chances of it breaking if dropped. What’s more, the hole for refilling is rather small. 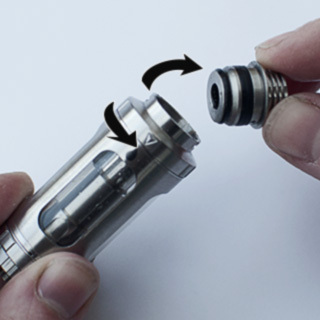 The design means you leave a small amount of e-liquid in the collar when replacing the drip-tip. On the other hand, the top-filling only system does prevent accidental leakage when changing coils or bottom filling! When we first trialled this we did get some leakage. However, this disappeared as we got more used to this device. I still don’t know if this was a feature bug or a beginner’s error! Where is the spare atomiser? 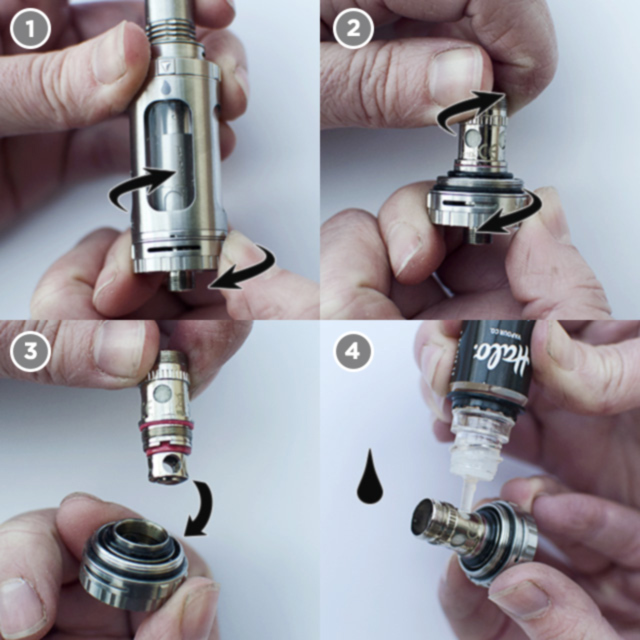 Pull out the molded fitting below the Aspire Triton, and you’ll find the spare atomiser! So don’t throw the box away after taking out your Triton. In these tutorials, we always try to cover everything, including the basics. But that doesn’t mean this is a tank for a beginner. I’ve already heard of a new vaper who managed to get e-liquid all over herself while trying to fill the device on the train. I’ve also heard of some more experienced users who have come unstuck using the device. The Triton drip tip comes with four ridges (which they call fins) above the variable airflow control. These are used to dissipate heat. This really does seem to work! When vaping with the airflow drip controls closed, at the same wattage as the Fury, there seemed to be a noticeable reduction in vapour heat. 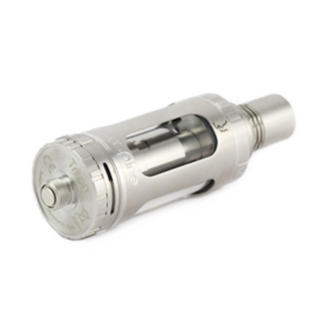 As with the Fury Tank, the Aspire Triton comes with airflow controls both at the base of the coil and on the drip tip. I find this is a fantastic feature which makes a real difference to the temperature of the vapour. 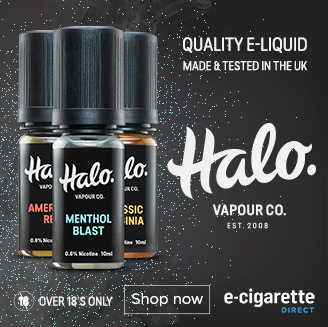 Leave open for a cool airy vape, closed for increased air resistance and flavour or anywhere in between to suit your preferences and power settings! How do you fill the Aspire Triton? 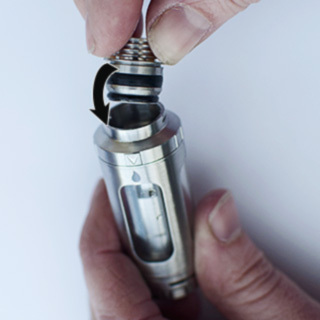 This can catch the unwary, as some new vapers have found out when trying to fill the device from the bottom! In fact, there’s no access to the tank from the bottom, which does reduce the danger of spilling e-liquid when changing coils. But I still prefer the Fury Tank’s rather clever top filling function. The Fury Tank comes with two modes – vape mode and refill mode. 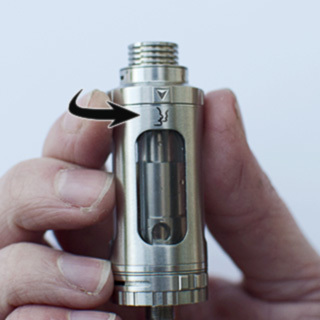 As you twist the Fury Tank into fill mode, the holes on the center tube will close off, protecting the cotton of the atomiser, and opening the refill holes. You’ll notice there are two holes for refilling. 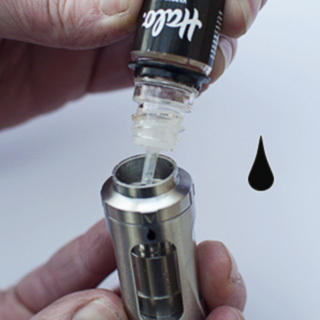 As you drip e-liquid into one hole, the other one releases displaced air. The Triton has a similar system – with one exception. The centre tube is not closed off when in refill mode. This makes it easier to flood the centre tube and coil. 2. Grasp the base of the drip tip and pull firmly. Then twist the dial to fill mode. 3. Inside the top of the clearomiser, you will see two holes appear either side of the centre tube. Drip in the e-liquid down one side hole, taking care to avoid the center tube. 6. Twist back into vape mode. Leave your tank for a few minutes to let the juice soak into the atomiser, and then give a few primer puffs before firing the device. 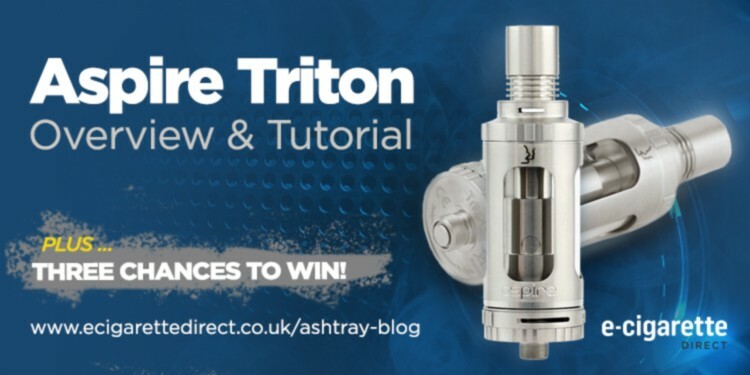 How Do You Prime a Triton Coil? As with all tanks (but especially for high end clearomisers designed for sub-ohming), priming your tank is essential. Failure to do so can lead to the cotton igniting and the coil burning – a dry hit. Unscrew the base of the tank anti-clockwise from the Triton. Drip e-liquid onto the cotton via the ‘windows’ and directly through the coil opening onto the mesh of the coil. Screw the coil clockwise back on to the Aspire Triton. How do you replace Triton Coils? Unscrew the base anti-clockwise from the tank. Unscrew the coil anti-clockwise from the base. Replace with a new coil, screwing it clockwise onto the base. Screw the base back on to the Aspire Triton. The Aspire Triton is compatible with any device with the ability to sub ohm and ideally with a wattage output of 30 or more, such as the Coolfire IX. We’d advise against using it with an eGo battery, even with the 1.8 ohm coil. Only compatible with TC devices if used with Triton TC coils. The Aspire Triton is compatible with any 510 drip tip. 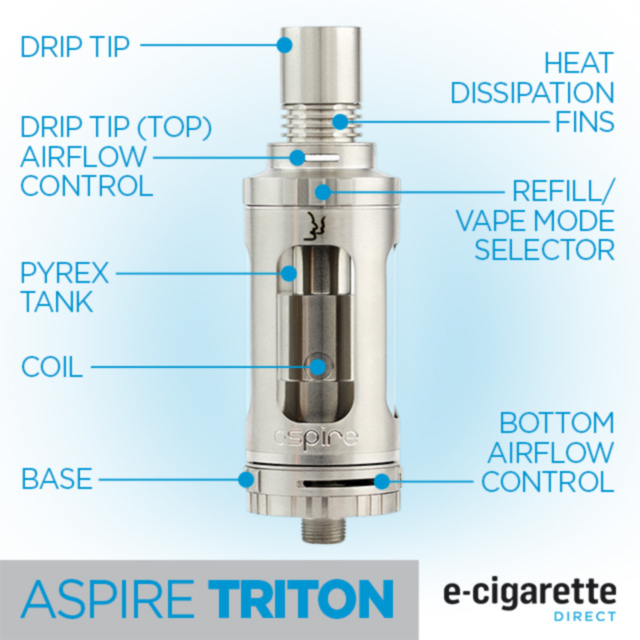 Click here to order the Aspire Triton on ECigaretteDirect! How did you get on with the Triton? Let me know in the comments! Is there any chance of a close-up to show the refill holes? Phew, I’ll see what we can do but they are very small! looks like something id like to try! I’m currently using the Triton and have loved it for ease of use, capacity, looks. I’ve forgotten to return the topsection to vape from top-fill twice, and immediately regretted it. I’ve had it since it’s release and the flavor and vape is great- I’m onto my 5th new coil-head and apart from some condensation have had no leakage. What does forgetting do? And do each of the airflow thingies have a different function/effect that might effect personal preferences? I am having constant problems with leakage from the bottom cooling slots. Every time the unit is placed on its side, the leakage occurs. Any suggestions please? Hi John, have you checked the o-rings on the coil? If you screw it in too tight you can damage it leading to leakage. I had the same issues. Juice leaking in pockets and tank draining from bottom air slots. I purchased new coils and now use only premium juice, try Bad Drip Labs, New York or Clown with max VG 80% and 20% PG. Flavours are amazing but weird! Tank is fantastic now, flow is cool and vape production using 0.3 ohm coils is insane. I bought the Aspire PockeX recently. And the drip tip gets EXTREMELY hot. What can I do to help this? Hi Diane, I’m not familiar with the exact model, but usually I’d recommend opening up the air flow holes to maximum. You could also try reducing the power or taking shorter drags, but that might affect your experience with the device.